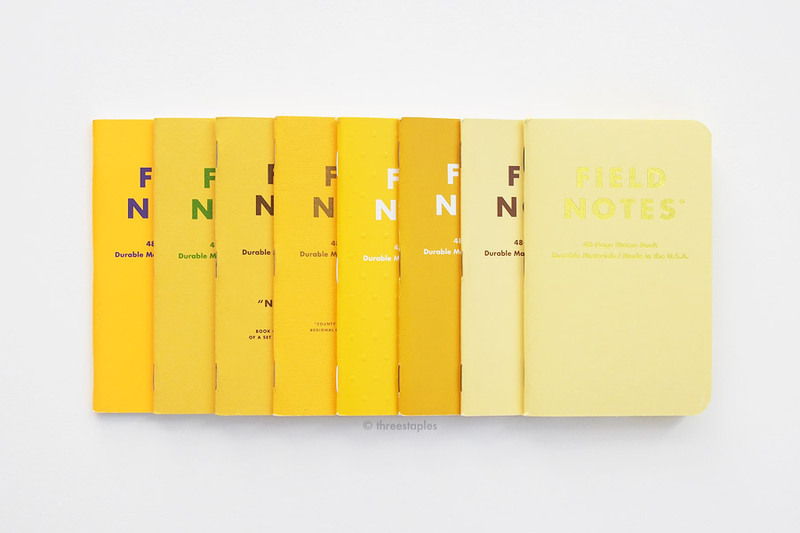 Night Sky is the summer release of Field Notes from 2013, 19th in their quarterly edition series (called COLORS back then). To say it’s an absolute favorite of mine would be an understatement. 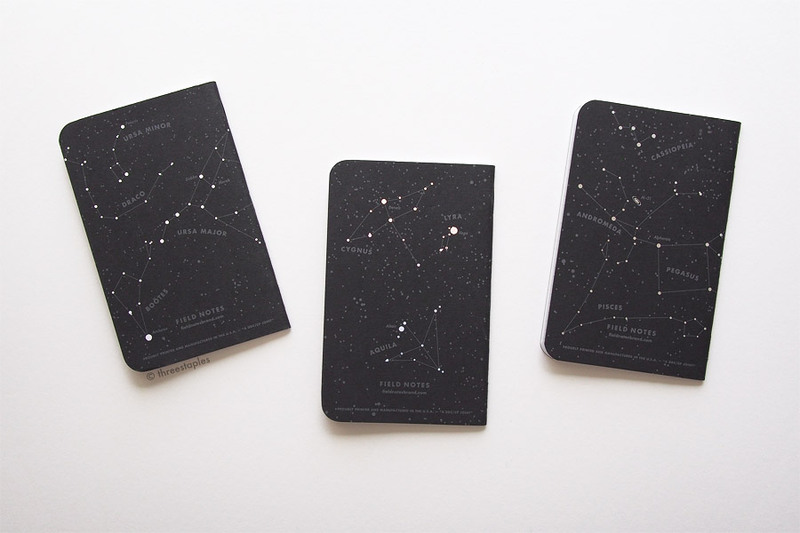 It’s an all-black edition of 3 different memo books that have summer constellations printed all over the back in holographic foil. What’s not to like? 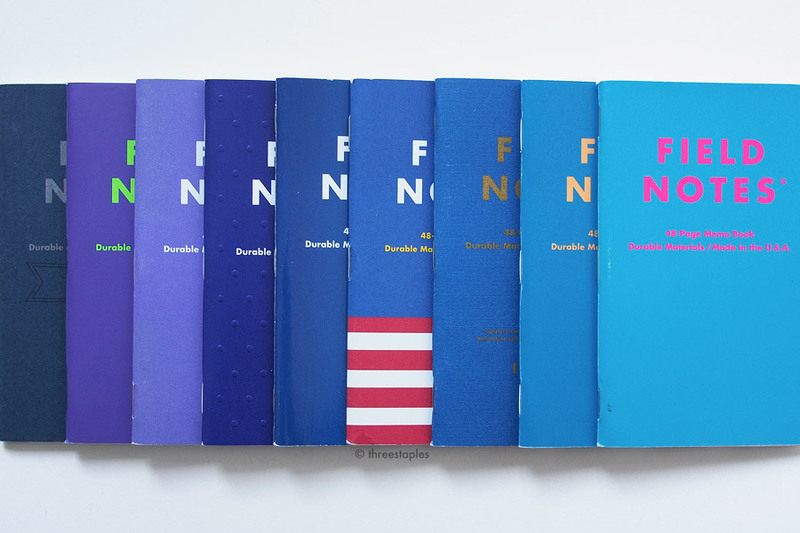 Apparently, everyone agreed: upon its release in mid-June 2013, Night Sky sold out in a week at Field Notes’ website, becoming one of the fastest selling editions at the time. It even sold out before the previous season’s Colors edition, America the Beautiful, had a chance to sell out. (Both had the same edition size of 15,000 packs). Unfortunately, I was not subscribed to COLORS when Night Sky was released, and was in a rare (and regrettable) period of “buy just one pack and get more later if I like it” state of mind. I remember having to resort to other online shops later, not without difficulty. I love Night Sky and rank it #1 in my FN ranking because it’s a black, understated variation on the classic kraft Field Notes, with just enough “oomph” in the form of holographic stars, one of my favorite visual motifs. The seasonal theme, spread out among three different books each representing early, mid-, and late summer sky in the northern hemisphere, is tastefully done without overwhelming the original design (constellations and asterisms are on the exterior back cover only). I’m a big fan of matte French Paper covers, too, and the versatility and practicality of the color black can’t be beat. I said I wouldn’t wax poetic, didn’t I? Oops. The point is, I love the theme of Night Sky and all the aforementioned details that support it, plus other subtle details like black staples, reticle-graph grid, and the grey ink on black matte paper. I’ll get into these specs in more detail in the next section, but I’ll briefly talk about its body paper here. As with many other older editions, Night Sky has the 50#T version of Finch Paper Opaque Smooth in Bright White, while these days you’re more likely to see the thicker 60#T or 70#T. It does feel decidedly thinner in my hand compared to the newer editions. I don’t hold this against Night Sky. In fact, I actually enjoy how slim and “pocketable” the older editions feel, and how when the spine is broken in, the cover closes on its own. And the paper in Night Sky performs well and feels smooth with my usual gel pens. 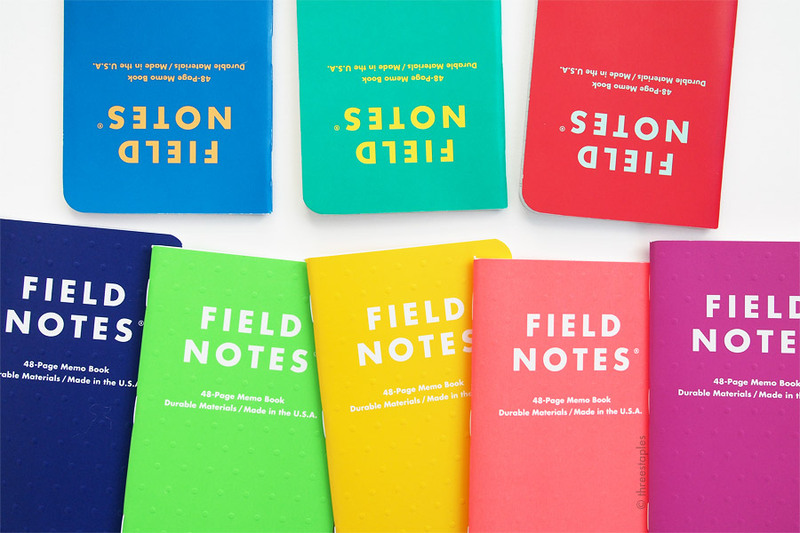 What sets Night Sky apart from any other quarterly edition of Field Notes is that it features holographic foil. It’s not the first to get foil-stamped; Balsam Fir and Day Game were the firsts (Winter 2010 and Summer 2012 respectively). But it is the first, and the only one so far, to be hot-stamped with silver holographic foil. I love how the stars flash and shine in a rainbow of colors depending on the angle I hold the books. 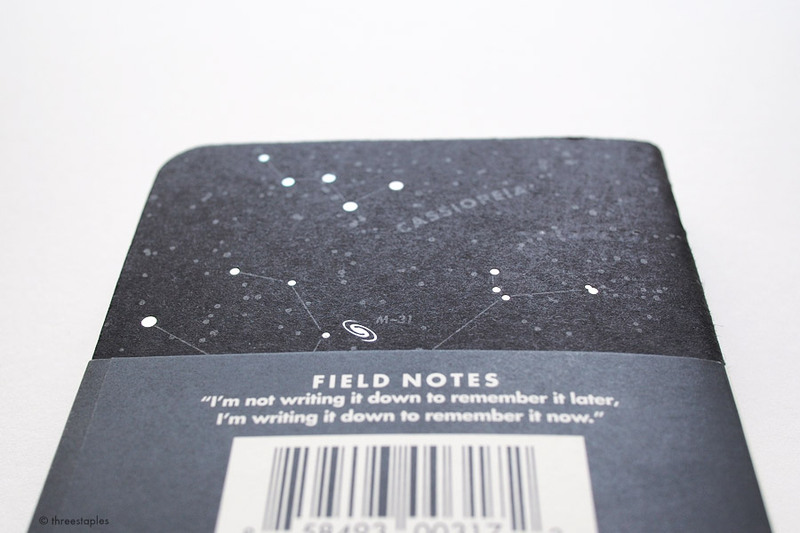 Fun fact: Field Notes originally wanted to print the stars in a glow-in-the-dark ink but it wasn’t “glowy” enough. Thankfully, they instead found a satisfactory alternative in the holographic foil, and I’m so glad they didn’t give up on the idea. I suspect the foil will last longer than glow-in-the-dark ink anyway. 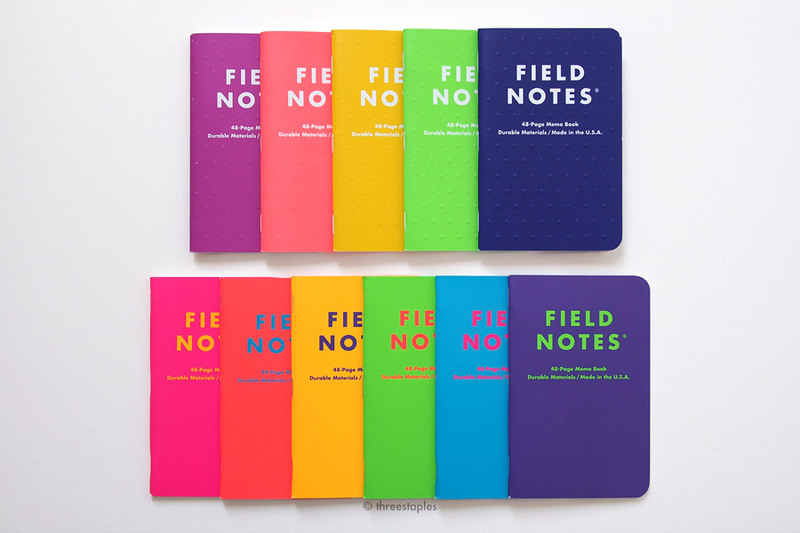 Not that I wouldn’t want to see Field Notes successfully incorporate glow-in-the-dark in a future release. But at this point, I’m not holding my breath. Another major “first” in Night Sky: black staples. It was a no brainer for a black edition, but I appreciate that they went the extra step and made sure that the only things shining on the cover would be the stars. By the way, Night Sky was not the first edition to deviate from the standard silver staples. America the Beautiful from Spring 2013, just before Night Sky, was the first ever Colors edition to do so, with copper-colored staples. Innards comparison, from left: graph grid in original kraft, dot grid in Pitch Black (1st version), and reticle grid in Night Sky. Night Sky was also the first to get a reticle-graph grid, a sort of a hybrid between dot grid and graph grid, with tiny cross-hairs like the ones found in optical instruments. A very fitting detail that makes Night Sky even more special. I like both dot grid and graph grid, and this reticle-graph has worked nicely for me so far. Not too distracting as long as I use a dark pen or pencil. There have been only two other quarterly editions that feature the reticle-graph grid since: Unexposed from 2014 and Lunacy from 2016, both fall editions. One last “first”: Night Sky was the first Colors edition to forego the “Practical Applications” section usually found on the back inside cover. I think it was a sensible design move, obviously to make room for paragraphs of corresponding information on what kind of constellations and asterisms to look out for at different times of the summer (at roughly midnight), like Ursa Major, “The Summer Triangle”, and Cassiopeia. But I like that they didn’t try to cram that on the back cover or the front inside cover. Other quarterly editions that skipped “Practical Applications”: Arts & Sciences, Two Rivers, and Byline. Coincidentally, A&S and Byline are both summer editions, just like Nighty Sky. 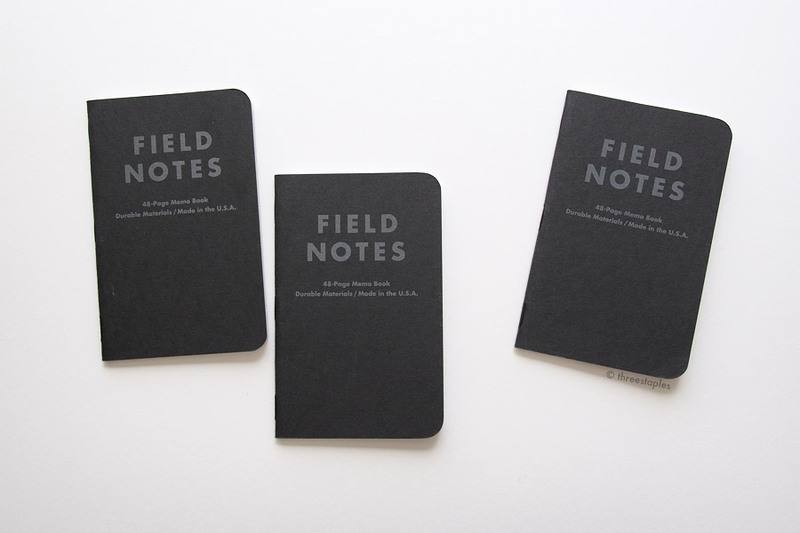 By now, I think it’s safe to generalize that black Field Notes are very popular. It’s been said on a few occasions that Raven’s Wing and Night Sky were some of the fastest selling Field Notes, and I wouldn’t be surprised if Lunacy (Fall 2016) is also up there. 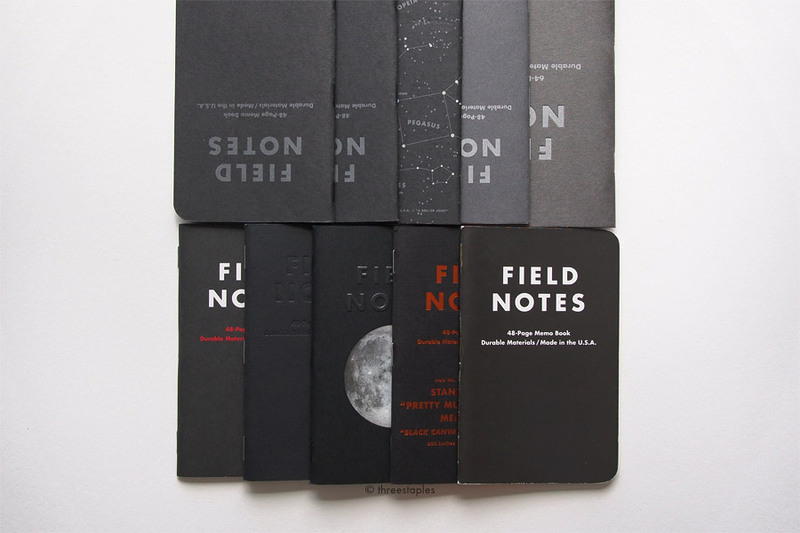 So it was not surprising that Field Notes followed up Night Sky with Pitch Black in November 2013 for their product line-up as a non-limited offering. Pitch Black has gone into a second iteration and looks different now, but the original version was a very close cousin of Night Sky, just like Red Blooded was an off-shoot of Fire Spotter in 2011. Same materials and colors but with dot grid, a new set of “Practical Applications”, and without the holographic stars on the back. Identical to Night Sky when viewed from the front, closed. The new version of Pitch Black looks great but I admit I was a bit sad to see the 1st version of Pitch Black go, because I knew it was as close as one could get to Night Sky. I already mentioned the film Field Notes made for Night Sky, but I would be remiss if I didn’t direct you to read up on how they filmed it at The Mather Overlook in The Great Basin National Park in Nevada. I haven’t watched the whole thing, nor do I have the right equipment to fully appreciate it, but there’s also a 6+ hour version up on YouTube, where you can watch the stars slowly moving across the sky in real time. (The HD version is up on Vimeo). Apparently, it was one of the very first 4k videos uploaded to YouTube. It must have been an unforgettable experience filming and seeing the stars at such a location, because Bryan Bedell (of Field Notes, who made the film along with Steve Delahoyde) often mentions it when asked which edition is his favorite (source links below). I love the lengths that Field Notes go to to create videos like this that don’t even show the actual product they’re promoting. CMD Space #57: Digital and Physical things, with Jim Coudal - Relay FM (August 16th, 2013): about 1 hour and 4 minutes in. The Pen Addict #69: Give ‘em Hell Bryan Bedell! - Relay FM (August 27th, 2013): about 18 minutes in. Overall, Night Sky is a great-looking and versatile edition that never fails to remind me why I love Field Notes. At this point, I don’t know if or how any edition will ever top it. If one ever does, then I’ll be very pleasantly surprised and I look forward to that day. Black staples (from left): Utility, Sweet Tooth, Capsule (AW 2014), Lunacy, Pitch Black (1st version), and Night Sky. Reticle grid comparison (from left): Night Sky, Unexposed, Starbucks Reserve “Capitol Hill”, and Lunacy. Quick black color comparison! Top row (from left): Pitch Black (1st version), Night Sky, Night Sky (back view), Just Below Zero, and Arts & Sciences. Bottom row (from left): TEDx Portland, Raven’s Wing, Lunacy, DDC “Pretty Much Everything”, and Drink Local “Stout”. For more “gray” color comparison, please see the Just Below Zero post. Night Sky is the 2013 Summer edition of COLORS, the 19th in the series. The old website said 700 subscriptions were available starting with Night Sky; the email announcement at the time said 500. Cover paper: French Paper Construction “Blacktop” in 100#C, printed with “Stealth Gray” soy-based Toyo ink and holographic hot-stamped foil. Thanks for reading until the end! What are your thoughts on Night Sky? 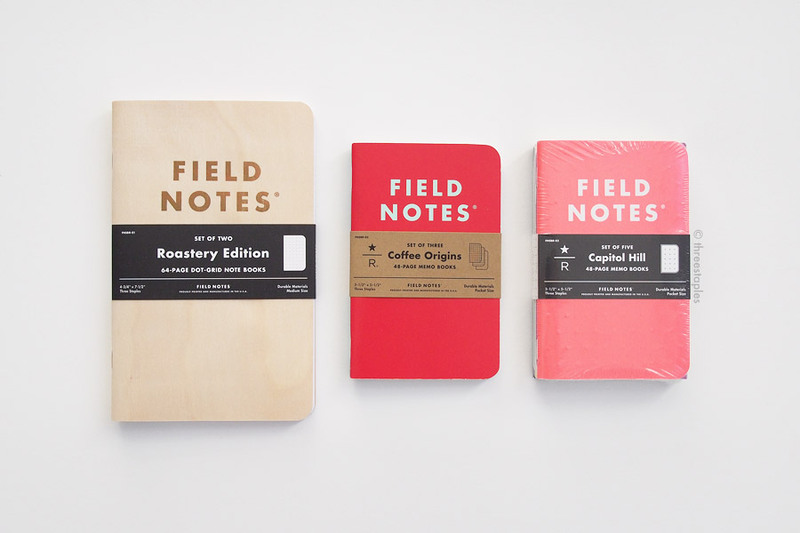 Starbucks “Capitol Hill” Edition is the 3rd collaboration between Starbucks Reserve and Field Notes Brand, following the Roastery Edition from 2014 and the “Coffee Origins” Edition from April 2015. It’s named after Seattle’s Capitol Hill neighborhood, where Starbucks Reserve Roastery & Tasting Room is located, and the rainbow colors of the set can easily be attributed to the neighborhood’s counterculture and LGBT communities. Capitol Hill, just like the previous Roastery editions, was made to be an exclusive, in-store item at the Starbucks Roastery. It came out in late 2015, either late November or early December. I was in Seattle in late November and had just missed it! Judging from the fact that the Roastery still had the first two editions in stock then, I felt it’d be safe to wait for another chance to visit in the future, instead of relying on the secondary market. And my patience paid off. During my recent trip to Seattle in July, I was finally able to get my hands on Capitol Hill. Fortunately, they still had a bunch left, albeit in a drawer (they’d just forgotten to restock the shelves). The first two editions were surprisingly still available as well. I’m glad to say, I like Capitol Hill more than I thought I would. There are many details in it to appreciate as a Field Notes fan, so I will list most of them here, with my thoughts mixed in. Disclaimer: The neon colors were nearly impossible to photograph. I tried to represent all five colors as faithfully as I can but know that the magenta book and the salmon book were especially difficult and that they can look different from what my pictures may suggest. The salmon one is definitely more fluorescent and lighter in real life. 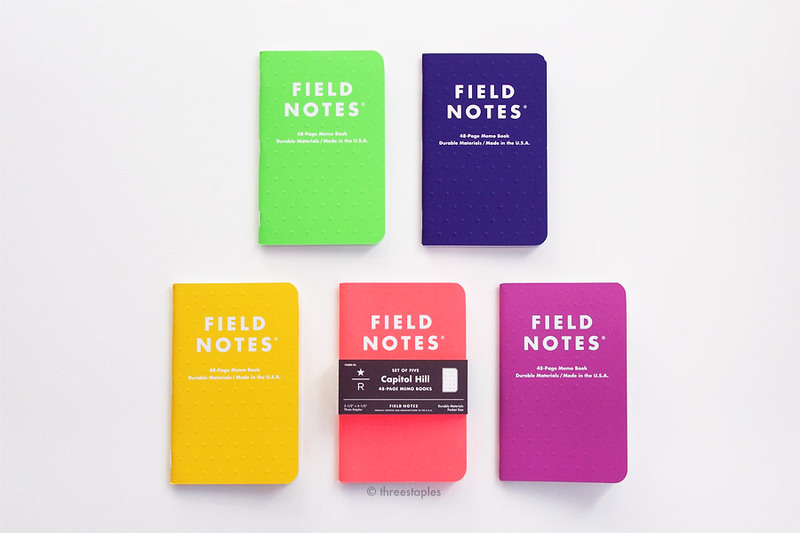 Capitol Edition is a 5-pack, with 3.5" x 5.5" memo books in 5 different colors. I have no way of verifying all the branded Field Notes ever made but I have never seen a 5-pack before. The 5 colors are, as best as I can describe: salmon, magenta, yellow, light green, and navy blue. You might describe them differently but this is how I see them. All are very saturated colors, with salmon and green being neon. They hurt my eyes. 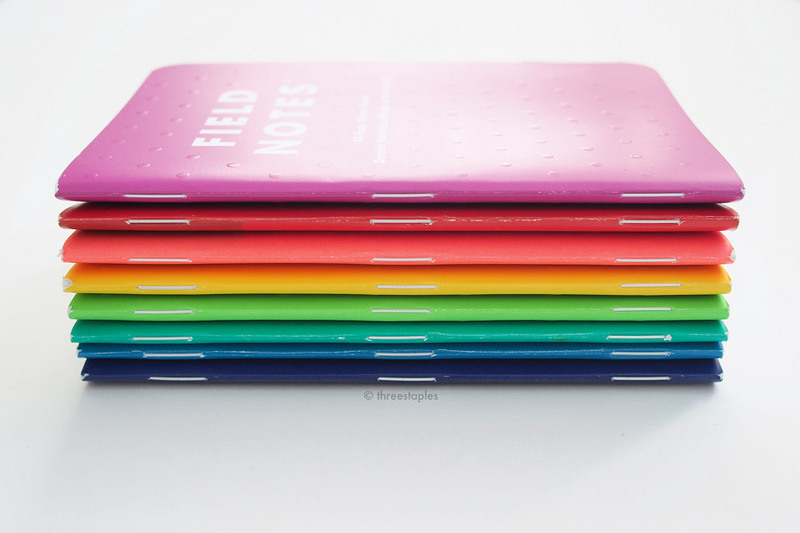 It’s interesting that they went with 5 colors, instead of 6, which is the typical number of colors in a pride flag, and we’ve seen a few 6-packs of Field Notes before, e.g. National Crop (Spring 2012) and Workshop Companion (Summer 2015). Maybe 6 would’ve pushed it over their desired price point? 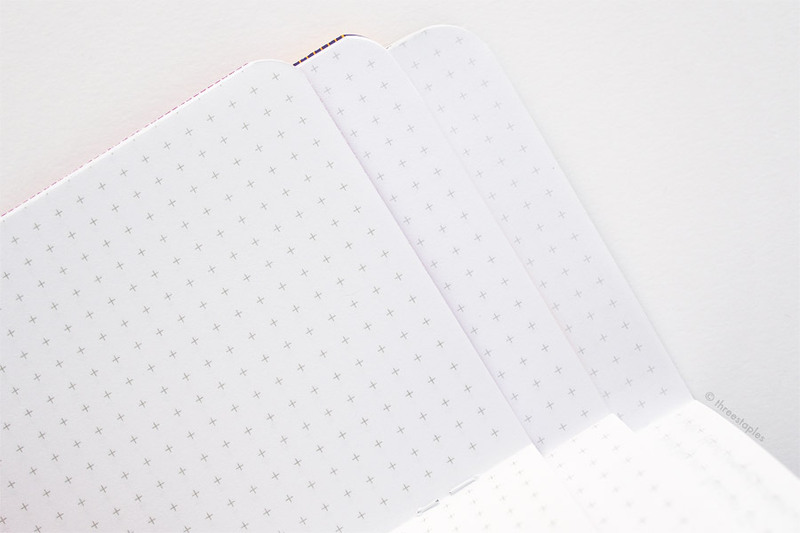 Covers are embossed with a polka-dot pattern, meaning the dots are raised up. Again, I’ve never seen this in Field Notes before. I haven’t written anything on the inside covers yet but when I do, I’ll have to watch out for these dots! Why polka dot though, I am not sure. Perhaps another reference to the Capitol Hill neighborhood? The embossing is done around all the text on the front and back cover, by the way. White staples. An excellent choice for these fun, bright colors and the white text. The previous Starbucks edition, Coffee Origins, is also bound by three white staples. The body paper is the white Finch Paper Opaque Smooth 60#T, which is the thicker version Field Notes is starting to use more these days. I really like this variation because it makes the memo book more substantial, and I can even use fountain pens in it. Reticle grid comparison (l to r): Capitol Hill, Unexposed, and Night Sky. The gray in Night Sky is slightly lighter than the other two. Reticle grid on the body paper of Capitol Hill is printed with Pantone “Cool Gray 2” Saphira ink. 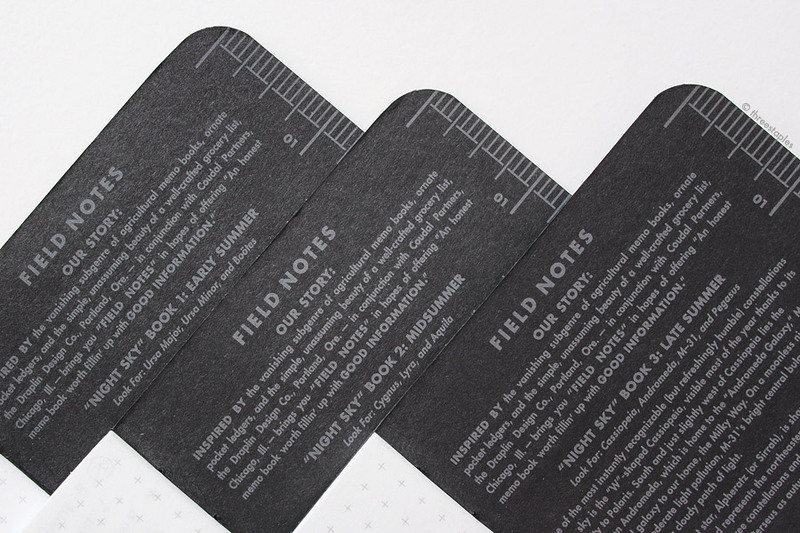 Other Field Notes editions that feature reticle grid are Night Sky (Summer 2013) and Unexposed (Fall 2014), which happens to also be printed with the same “Cool Gray 2” ink. Texture comparison of Capitol Hill (top) and Coffee Origins (bottom). Covers are made with Sappi McCoy Silk in 100#C. We’ve seen the same paper in the covers of Coffee Origins and Unexposed. If it weren’t for the embossed dots all over, Capitol Hill would feel identical to Coffee Origins texture-wise. Both have the same slightly rubbery, semi-glossy finish. Based on my experience, these covers are quite durable, and I like how pliable they feel. I should note, on the topic of texture, the inside covers of the salmon and the green books have almost powder-y feel to them. They’re definitely not as glossy as their front covers are, or as the insides of the other three colors in the set are. I am not sure if that difference is a function of the paper or the inks (the salmon and green ones are the most neon of the set), or if it’s unique to the set that I opened. Starbucks Reserve Coffee Origins (top row) vs. Capitol Hill (bottom row). In real life, the salmon book on the lower right appears lighter and more neon. The magenta book is slightly bluer. Capitol Hill (top row) vs. Unexposed (bottom row). “Pink” comparison (l to r): Unexposed, Capitol Hill, and XOXO'13. 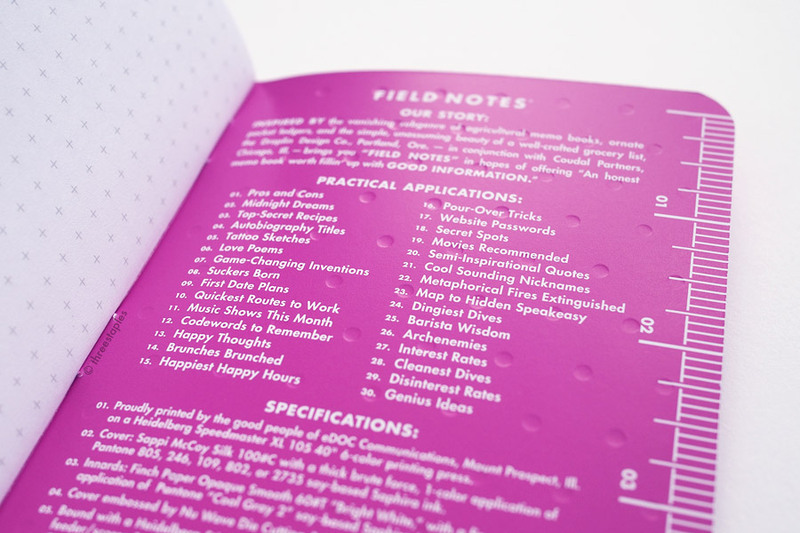 The magenta is very, very similar to the color of XOXO 2013 edition. The colors used, as printed on their back covers, are Pantone 246 for Capitol Hill and Pantone 2395 for XOXO'13. The XOXO cover is matte though. 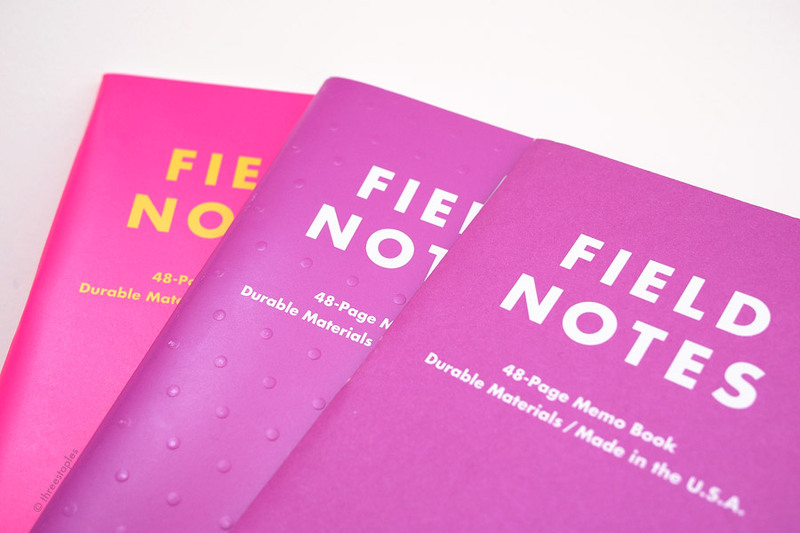 I’m actually glad that they’re so similar because I like the color and wouldn’t mind more of these medium “pink” Field Notes. Another color that I love from the set is the vibrant navy blue. Hard to describe it but it looks like there’s a hint of purple in it, too. 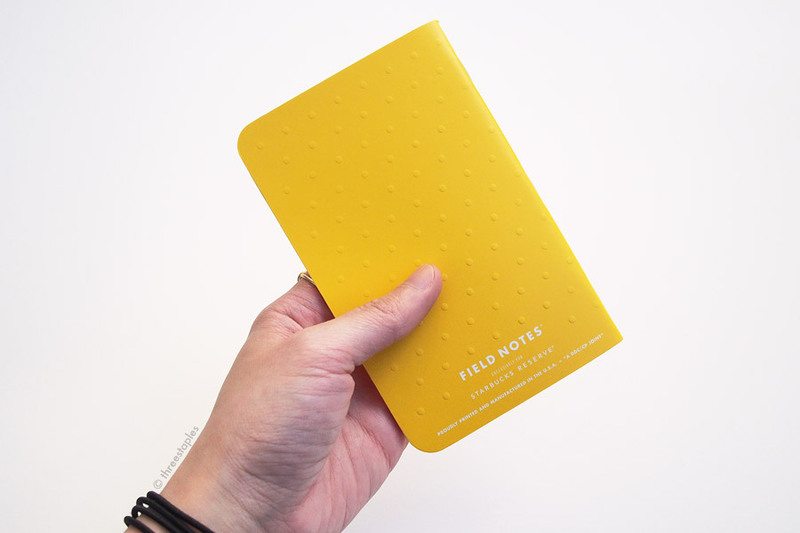 A unique color in Field Notes so far in my opinion. My least favorite is the salmon one, the one unfortunately packaged on the very front. This book unfortunately had a badly cut corner. The embossed dots are starting to rub off a bit. 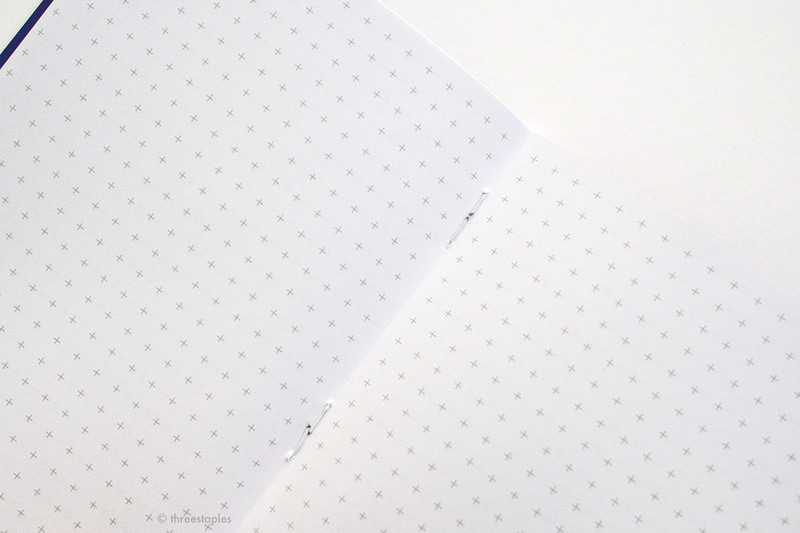 Capitol Hill draws several similarities to Unexposed and Coffee Origins but its embossed polka-dot covers, white staples, and thicker body paper make it a rather unique edition. I like the inspiration behind it, too. I may not love fluorescent colors but not all are that harsh on the eyes; it has some standout colors after all. I’ve been using the magenta book for a few weeks now, and the embossed dots and edges are starting to wear down nicely, with the white of the base paper showing through. Overall, it’s a great, fun edition worth a visit to the Roastery if you’re a fan of Field Notes and are in the area. Especially if you like bold colors and wouldn’t mind running into a camera everywhere you turn. It gets crazy packed with tourists there. All three Starbucks Reserve editions (l to r): Roastery Edition, Coffee Origins, and Capitol Hill. The back view of the three editions. Not everything can be printed in Futura Bold! And what's with the alignment on the birch cover? Rainbow! Coffee Origins + Capitol Hill. White staples, too! Coffee Origins + Capitol Hill. White staples (from top): Capsule AW2015, Snowblind, Starbucks Reserve Coffee Origins, and Capitol Hill. Cover embossing: by Nu Wave Die Cutting & Finishing, Chicago, Ill.
Quick orange color comparison (l to r): Expedition, Unexposed, Capitol Hill, Neon Ice Pop, DDC Pop-Up, Butcher Orange. I gave up trying to color correct these. Just know that the middle four books are supposed to be “neon”, with Neon Ice Pop being the least neon. The DDC Pop-Up edition is supposed to be lighter and REALLY fluorescent. Quick yellow comparison (l to r): Unexposed, Packet of Sunshine, National Crop “Corn”, County Fair, Capitol Hill, Drink Local Lagers “Pilsner”, Drink Local Lagers “Pale Lager”, and Sweet Tooth. Quick green comparison (l to r): Summer Camp, Unexposed, Capitol Hill, Our503.com, and Shenandoah “Sweet Birch”. Quick blue comparison: American Tradesman, Unexposed, XOXO Festival 2012, Capitol Hill, Cold Horizon, Coal x DDC, County Fair, Coffee Origins, and Unexposed. Were you able to get your hands on this Capitol Hill edition? Which color is your favorite?